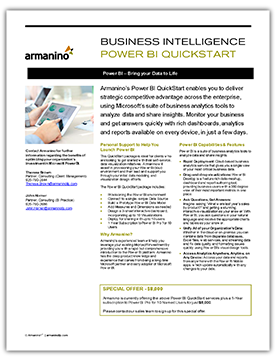 If you’re ready to start delivering strategic insights across your enterprise, our Microsoft Power BI QuickStart Package can get your business intelligence reporting up and running in days. Power BI leverages your existing Microsoft technology. It features intuitive analytic tools and interactive visuals you can access anywhere. Download our QuickStart sales sheet for details and pricing.